******************** YOU ARE looking ON ONE (1) ***********************Yukon Gear Women's Windproof Softshell Fleece Jacket, Mossy Oak Break-Up Country, Medium94% Polyester, 6% ElastaneImportedWindproof, water resistant, fleece linedWelded zippers on hand and sleeve pocketsPoly/Elastane wrist gaiters to seal out coldFeminine fitCamo and color combine for unique styleFor fall, winter, spring and even cool summer nights this is the ultimate go-to jacket. 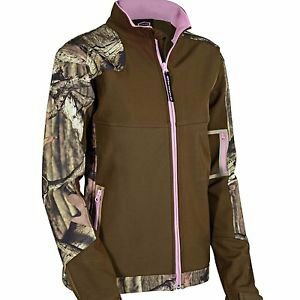 Windproof, water resistant and fleece lined with just enough camo to make a statement and a feminine cut that is also forgiving, this jacket is versatile and stylish. Welded hand and sleeve pockets provide storage and poly-stretch wrist gaiters seal out cold air while providing extra comfort. Featuring Mossy Oak camo this jacket is a must-have.Windproof, water resistant, fleece linedWelded zippers on hand and sleeve pocketsPoly/Elastane wrist gaiters to seal out coldFeminine fitCamo and color combine for unique styleSpecificationsGenderWomenFabric ContentPolyesterAssembled Product Dimensions (L x W x H)36.00 x 22.00 x 0.55 InchesConditionNewManufacturer Part Number140621ColorMossy Oak Break-Up CountryModelWSSJWBrandYukon GearCountry of Origin - ComponentsImportedCountry of Origin - AssemblyImportedP.